Installing an outdoor camera can be a lot of work. That’s why a lot of people purchase an indoor home security camera for outdoor monitoring. They’re in for a surprise when they do this as it’s not as simple as pointing it out a window and leaving it there. First, you need a good place to put it. We look at a good solution for which is a window shelf for Nest Cam or DropCam or other similarly shaped home camera. It’s a rather innovative way to attach a Nest Cam to a window and it will work on other similarly sized cameras as well. We have written extensively on the subject of using many popular brands of home security camera through a window. Be sure to read Using a Nest Cam Through a Window and Using a Yi Home Camera Through a Window. These articles tell you how to do it and the settings that need to be used for the best video. You want to be sure to get the lens as close as possible to the window pane, turn off the status light and IR lights. It also helps to have some good outdoor lighting to make up for the loss of night vision capability. We have found several ways to effectively attach a Nest Cam to a window. This is a new one for consideration and gives the camera a more permanent hold. There is often a challenge with elevating the camera high enough up a window to get a solid view of what you want to see. That’s where the ElHook Stick-On Nest Cam Security Video Wall Mount comes into play. The photo that accompanies this article shows the components that make up this accessory. The shelf can also be attached to a vertical wall. As previously stated, while this shelf can be used to attach a Nest Cam to a window, it also fits other brands. The base of the shelf measures roughly 2.5 x 2.5 inches. Any similarly sized security camera can fit onto the shelf. Besides Nest Cam, candidates that come to mind are DropCam Pro, Yi Home Camera and the Wansview Home Camera. We have also found this to be a near perfect fit for a WyzeCam. You get two of these shelves in a package. The shelf is made of plastic. Included is a a set of two adhesive strips that are used for attaching the shelf to the window or wall. First be sure to clean the surface with an alcohol wipe. This wipe isn’t included which is a bit of a mystery as the instructions that come with the shelf for Nest Cam specifically exclude use of commercial cleaners that you would buy in a grocery store and likely have stored under the sink. After you finish cleaning the area, it’s time to attach the shelf for Nest Cam to the window or wall. 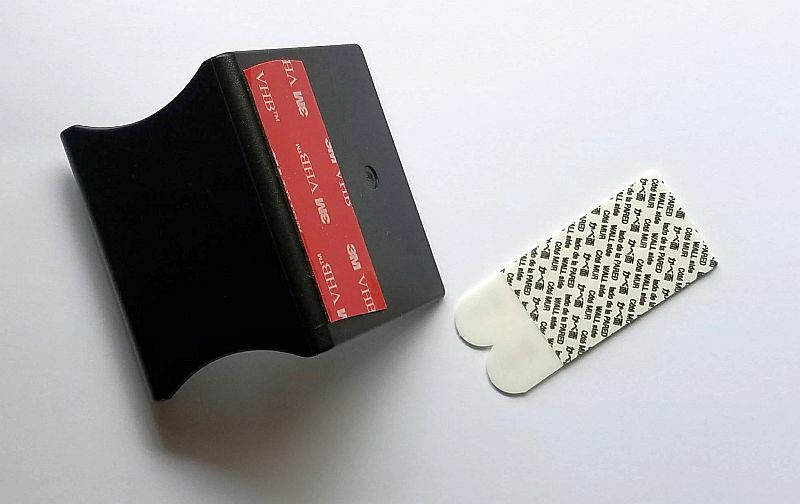 The adhesive strips are designed to provide a strong temporary hold onto the flat surface. Be aware, you only get one chance at this so be sure it’s properly placed and level prior to committing to attachment. Be sure to leave the rounded parts of the adhesive strips a little exposed. This will make it easier to remove the shelf if you ever need to do so. Now let’s attach the camera to the shelf. A 3M VHB red adhesive strip is already attached to the top of the shelf. This is used to adhere the window shelf to the camera. VHB stands for for Very High Bond. It’s a permanent adhesive so be aware it will take a little work if you decide to remove your camera from the shelf. Often it’s a tedious process of slipping a thread between the camera base and shelf. The ElHook Stick-On Nest Cam Security Video Wall Mount is a nice add-on accessory that will effectively attach a Nest Cam to a window. It also work on many other brands of home security camera. Remember if using this to attach a Nest Cam to a window, be sure to get the lens as close as possible to the window pane.